Greater Richmond Chorus - 2018-09-27 - Chorus news item: Oct 25- Fall Into Singing Guest Night! Oct 25- Fall Into Singing Guest Night! 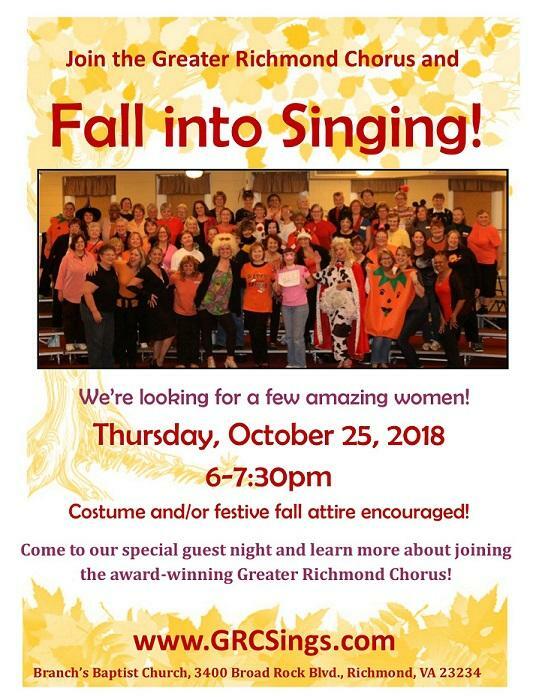 Fall into singing with the Greater Richmond Chorus! Join us for our fun and festive GUEST NIGHT on October 25, 2018. You'll learn more about barbershop singing and the joy of singing in an all female, award-winning chorus! AND, since we're so close to Halloween, costumes and festive fall attire are encouraged! For more info, contact any chorus member, message us on Facebook, or send an email to membership@grcsings.com. Hope to see you there!